The 60s and the 70s were certainly the decades of female trios…. 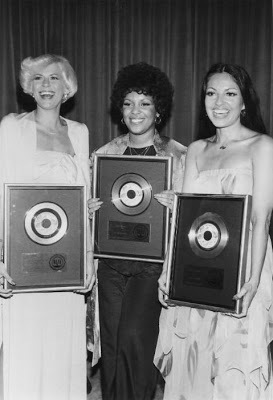 The most famous ones are maybe The Supremes and The Three Degrees, followed by The Ritchie Family, Silver Convention and many others. And while a lot of people will remember the great 1977 hit “Angel In Your Arms” – the name of the group who originally sang it might have been long forgotten. They were called Hot, and consisted of a black girl, a white girl and a latin girl – quite an Oreo combination! Hot released 3 albums, starred in their own movie and the three ladies had careers in music both before and after their time in Hot. Stay tuned – a closer look at Hot will follow in a short time on this site.